WikiBranding: The sun speaks again. During the Democratic National Convention, the Sun decided it was time to address planet earth, speaking through its friends at Applied Materials (and one of colleagues at BD'M, copywriter Phil Calvit, a.k.a., the voice of the sun). 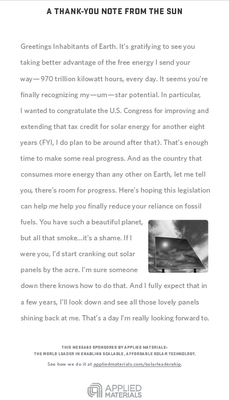 The Sun spoke again in today's Wall Street Journal, this time expressing its appreciation for the Congress' decision to extend the Investment Tax Credit which will continue to provide much needed relief to those companies investing in new alternative energy technologies, such as renewable solar energy. BD'M also created this site to show how Applied Materials is making good on the Sun's promise.